A new take on roti. Caribbean roti is simply, a painstakingly complex flatbread, served with curries or stews in multiple different ways. Roti is also a symbol of the Caribbean’s brillaint but complex cultural history. 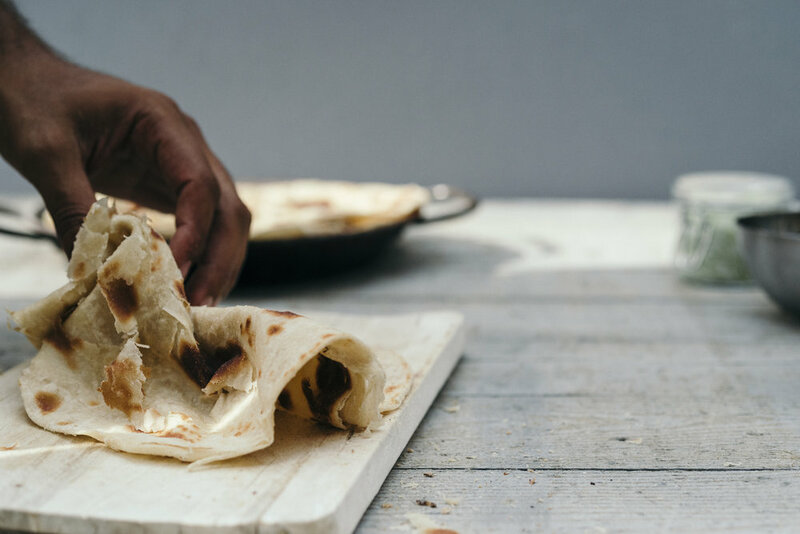 Originally brought to the islands in the 1830’s by indentured Indian labourers, roti quickly became one of the most culturally significant foods in Caribbean. Guyana and Trinidad who have the biggest indo-Caribbean communities are today the bastians, but roti is eaten all over the Caribbean and the diaspora. Our version of roti in London is our continuation of Caribbean culinary culture into a new space. We draw inspiration of how to make roti skins from our families, our Trinidadian friends, but also because we live in multicultura London, we take tips from Malaysia and India itself. Making roti is a ritual. After years of practice we’ve created perfect roti skins- buttery, layered and crisp, our flat bread is made to partner our spicy curries. We take unknown classic Caribbean curries from different islands of the Caribbean and remix them. Here is a sample of our unearthing and innovative menu. The question of ‘how to eat roti’ can spark days of contention. The cuisine’s connection to the Caribbean’s multicultural history means that it is a important part of the culture, particularly in Trinidad and Guyana.